West Bengal Central School Commission /West Bengal School Service Commission (WBSSC) is ahead to conduct the Group C and Group D examination. This year the competition is higher for the Group C and Group D posts. All the hopefuls who are going to attend the written test can get the WBSSC Group C, Group D Hall ticket from the official portal, westbengalssc.com. The WBCSC is going to organize the WBSSC Group D/Group C written test in August/September months. Hence applicants have to download WBSSC Group C, Group D hall ticket to attend the examination. Hall ticket verification will be done at the examination centers. Do not forget to carry the admit cards while going to the examination. Make sure to carry any of the valid identity proof such as Voter Id/Aadhar Card or any others while going to the examination. Check more details such as examination date, and other important guidelines from the following. West Bengal Central School Commission is the state level organization that issues various notifications annually. Recently, the notification for 591 Group C and Group D posts such as Clerk, assistant, and others. Many of the hopefuls have applied for the WBCSC posts during the application dates. The organization received a large number of applications from the interested and eligible aspirants. The organization is going to conduct the written test and interview rounds for the aspirants. The organization is going to conduct the written test in the months of September month. 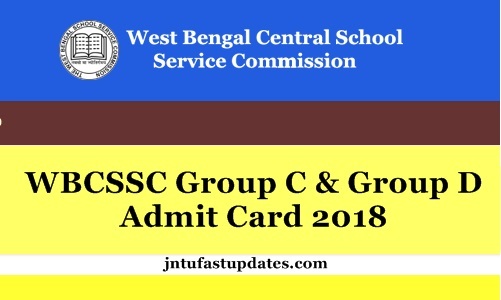 Applicants who had applied for the Clerk, Group C, and Group D posts can get the admit card from the WBSSC official portal, westbengalssc.com. The organization will release the admit card before 10 days of the examination (approximately). Candidates can download it and check the details of examination such as examination center, date, timings etc. also check the details of name, register number, date of birth, etc from it. Carry the admit card/hall ticket along with any of the valid identity proof. On the homepage “West Bengal Group C and Group D Admit Card 2018” Link appears on the screen. Dear sir please inform to me admit card date and exam date wbssc group d…. WBSSC CU er admit Kobe debe ? junior ASSISTANT KA ADMIT CARD KAB AYGA? wb ssc group c exam kab hoga please reply.